Just the second loss of the year for the Rowan women’s soccer team proved to be their season’s undoing. 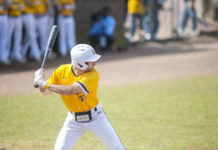 Rather than preparing for another playoff game, the Profs must hit the offseason early, their schedule cut short by Christopher Newport, 3-2, in the opening round of the NCAA Division III Championship Tournament. It is a frustrating conclusion for a team that trailed for only 58 minutes all year, allowing a season-high in goals. But a result like last Saturday can happen when one side capitalizes in the tense tournament setting, head coach Scott Leacott said. A one-goal battle that usually goes the Profs’ way instead went in favor of CNU. Senior forward Maxine New noted the Captains’ defensive strength and their height, which allowed them to win and score on long balls in the box. “Their center back was very fast, so me personally being in a foot race with her, it was hard to get behind her,” said New, who tallied a goal and an assist in her final game. Leacott stressed that the way his team played in the tournament game was not indicative of their performance during the 2016 season, a campaign filled with a number of eye-popping achievements. Chief of these could be Rowan’s program-record 16 shutouts, all with NJAC Goalkeeper of the Year Shelby Money in net. It took until Oct. 8 against Montclair State, their 13th game played, that the Profs finally allowed a goal. 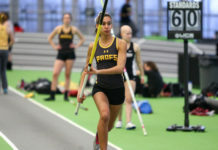 The Profs’ first loss did not come until the regular season finale against The College of New Jersey on Oct. 26. Rowan was able to advance to the DIII tournament for the second straight year after repeating as New Jersey Athletic Conference Championships. Prior to the brown and gold doing so, a women’s soccer team had not won the NJAC title in back-to-back seasons since 2009-11 (The College of New Jersey). Although five seniors will be gone from the current team, which had seven players earn All-Conference recognition, the depth of the roster spells good fortune for the program’s future. That depth was on display this season in the Profs depleting their reserves time and time again. In addition to the 11 usual starters, 10 others saw at least 270 minutes of game action, or the equivalent of three regulation games. The promise of what’s to come for Rowan has both the coach and New excited — this after one of the strongest seasons record-wise in a few years.